NEWINGTON, CT, Jun 29, 2000--The Amateur Radio world is mourning the loss of R. Louis Varney, G5RV, who invented the world-famous G5RV antenna. Varney died Wednesday, June 28, at his home in West Sussex. He was 89 and had recently been reported in failing health. Varney remained an active radio amateur until very recently and kept regular on-the-air schedules. In announcing Varney's passing, the Radio Society of Great Britain said, "His proficiency with the key was legendary, and he spent a great deal of his time experimenting with antennas, and employed a full-size and a double-size G5RV (both fed with open-wire feeders) for his own radio operations." 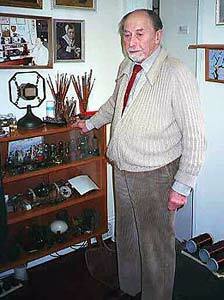 Varney was an RSGB member for 74 years, and he served as life president of the Mid-Sussex Amateur Radio Society. In addition to Amateur Radio, Varney enjoyed painting and gardening. He also collected and had an interest in antique radio equipment and tubes. His wife Nelida is among his survivors. Services are set for July 4 in Brighton, England.